Today’s consumers have much more to think about than they did in the past. When goods were made on a local, even national, level, shoppers could rest assured that what they were purchasing was made with care, and with American jobs and communities in mind. In recent years, much of our manufacturing has moved overseas. While this sometimes allows us to seemingly have “more” at a “cheaper price,” there are costs associated with buying overseas goods that we might not think about, or want to think about. Do you know what you’re adding to your shopping cart when you purchase imported flatware from a big box store? And more importantly do you know who made it, and under what conditions? Unfortunately the use of child labor, slave labor and even prison labor are more common than we would like to think about. Furthermore, the conditions in many overseas factories are often deplorable and unsafe for the workers. Often these workers barely paid a living wage, conditions that we have categorically rejected as a society here in the United States. Yet somehow folks seem to look past that when the throw the box of “whatever” in their shopping cart. At Liberty Tabletop, we take ethics and social responsibility very seriously. We believe we have a responsibility to support the community we operate in, and we view our business as not only something that supports our families, but as a cause that everyone can embrace. We believe our employees should work in physically safe and environmentally safe conditions. We treat our employees like family members – as a matter of fact, many of them are! It is a priority of ours that our products are safe to make and safe to use, which is why we manufacture them from certified metal from safe, United States producers, and we never use dangerous chemicals in any of our processes. When you buy from Liberty Tabletop, your money supports our local economy. Supporting U.S. companies like Liberty Tabletop helps to build the U.S. tax base, which in turn supports other functions of this country like firefighters, police and other public services. Maybe you’ve never really thought about it, but when you purchase American-made products like our flatware, you’re not only ensuring the jobs of the people working in our factory, but you’re also supporting much more. Our suppliers, accountants, lawyers, and systems support companies are all a part of our community, too. We pay local, state, federal and property taxes, which all primarily come back to us in the form of support for our community. When you buy imported products, there is no contribution at all to our fiscal infrastructure. 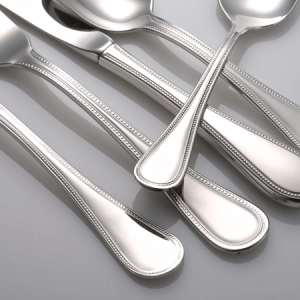 Liberty Tabletop offers flatware produced in a socially responsible way at a competitive price, too. You might be wondering how can a company that produces their flatware in the U.S.A. compete with major brands, which produces their flatware overseas? After all, our wages, benefits, safety practices, safe environmental practices, taxes, etc…. all add cost that overseas manufacturers do not incur at the same level. The answer is simple – at Liberty Tabletop, we’ve cut out the middleman and sell directly to you, the end customer. This is not only socially responsible, it enables us to be competitive. When a customer purchases imported flatware from a big box store, the flatware company is giving up to 70 percent of their profit to the store. What is worse, the “iconic brand” that puts their name on the box takes about half of what is left over leaving the manufacturer with less than 15% of what you end up paying. It does cost us more to make product here in the United States, particularly since we are committed to producing quality and not cutting corners. Fortunately, with the direct selling model we can afford to produce a quality product, follow the ethics and socially responsible practices we all support, and deliver it to you at a competitive price! How can we be sure we are competitive? We Benchmark: Think made in U.S.A. quality and ethical behavior costs too much? Think again. At Liberty Tabletop, we benchmark our pricing against imports to verify that our lines sell for an equal or lower price vs. the imports. That way, we can ensure that we bring you superior flatware produced with humanity in mind. It is our hope that one day, legislators will recognize the dichotomy and level the playing field, thus encouraging ethical and socially responsible behavior around the world. Until then, we can all choose to affirm our beliefs in what is right and wrong with our day to day purchases. We can vote with our pocketbooks and buy from manufacturers that are socially responsible, care about the health and safety of their customers & employees and behave in an ethical way. At Liberty Tabletop, we know that everyone wants peace of mind that the products they purchase are a good value, are well worth the purchase price, and meet or exceed all expectations. This can be difficult when purchasing products over the Internet based on an image on your computer screen. We are very confident that our flatware will pass the test and therefore back up your purchase with a 100 percent satisfaction guarantee. If you are not completely satisfied with your purchase for any reason, simply return it within 30 days and we will return your full purchase price, no questions asked. We know how important it is to you and your family to choose products that are made in the U.S.A., secure American jobs, and are manufactured in a socially responsible fashion. We think you’ll be pleased with the beautiful offerings from Liberty Tabletop. To learn more, browse our website and see for yourself the difference in quality you’ll experience when you choose Liberty flatware for your table.